Well now it’s time to unload all my cosmetic cleanliness best standards onto my readers! Again, these guidelines work well for me, and I think they’re practical for everyone. So, you’ve got this awesome makeup collection… now what? How should you clean your makeup and how often? Using a Q-tip (you’ll learn that Q-tips are any makeup girl’s best friend for many reasons), gently scrape a thin layer off the top of the lipstick at an angle. Try not to remove too much product. Then, twist up your lipstick a bit, and soak in rubbing alcohol for 30 seconds. Let air try and you’re done! The rubbing alcohol won’t damage your lipstick at all. Simply sharpening your pencil (eyeliner, lipliner, eyebrow, etc) after each few uses will do the cleaning for you. A few quick twists will do the job. If you have a twist-up pencil, use the same rubbing alcohol technique described above for lipsticks. This includes eyeshadows, blushes, and bronzers, which are probably easiest to clean. Take a butter knife or even a tissue and wipe a thin layer of the product off. Be sure not to scrape too hard so that your powders stay intact. If you want to be extremely thorough, you can also put some rubbing alcohol in a travel sized spray bottle and spritz your powders with afterwards and let dry. As I mentioned earlier, facial brushes should really be cleaned once a week and eye brushes after 1-2 weeks. I have a detailed makeup brush cleaning tutorial as well. 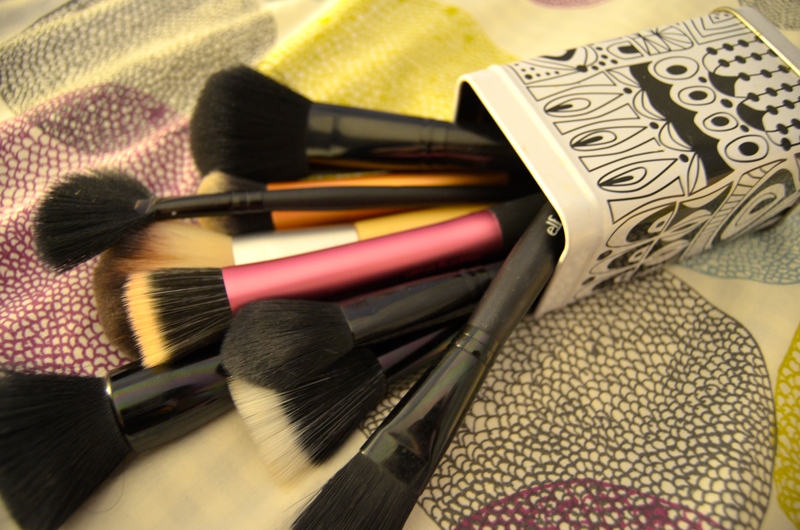 Keeping your makeup brushes clean will help keep the rest of your makeup collection clean. If there’s once piece of advice I can give, buy foundations with a pump or squeeze applicator! This makes cleaning so much easier, you can simply wipe the applicator off with an antibacterial wipe. If you have an open container foundation that requires the use of your finger to access the product, switch up your technique to using Q-tips or a makeup spatula to access the product. This will increase the cleanliness of your foundation over time. Whether you apply your makeup in the bathroom or bedroom, keep your space clean. Be sure to wipe down countertops with antibacterial soap or wipes at least every 1-2 weeks. Be sure to dust your space to keep it fresh and clean as well! Your makeup bags can also be a place for bacteria to linger. Wipe out the interior of these cases with antibacterial wipes every few months as well. I learned from a few fellow beauty gurus, that you can even leave your makeup bags in the freezer overnight to kill all bacteria after using wipes! Mascara is a tricky product to clean, and your best bet is to invest in a new tube every 6-12 months. You should not be keeping mascara around for years and years. In order to prevent waste, I like to use only one mascara tube at a time. I use up mascara within about 6 months anyways, so it’s not like I’m wasting money. Foam sponges are also almost impossible to clean. If I can pass on any piece of advice it’s to invest in brushes over sponges. If you do use sponges, be sure to toss every few weeks and use a new one. What else should you know about making your makeup last longer? If you’re sharing makeup, think twice. Bacteria can live on your makeup for days and if you’re sharing makeup it’s more likely to spread from person to person. Try to keep a personal makeup collection that you and only you use. Some of the worst items to share include: eye makeup (mascara, liner, shadows), lipstick, and brushes. If you do want to share makeup, cleaning it after each use is essential to stop the spread of the bacteria! This goes for professional makeup artists.